The Rubbish Diet: Zero Waste Week: It's not over yet! Day 5 of Zero Waste Week pretty much passed without incident, with the exception of a couple of butter wrappers, which I'd set aside for washing. We generally use unsalted butter as it's useful to have in the fridge for making cakes. I'd made a batch of fairy cakes earlier in the week and by Friday, we'd used up the remaining butter and are now left with the wrappers. So....to bin...or not to bin...? That is the question. The council website doesn't say I can't, yet there's no info on the packaging to say I can! My natural assumption based on other similar products that I have researched is that it can't be recycled and previously I would have thrown it in the bin. But it's Zero Waste Week, so I thought I should make the effort and make one final check, but everyone's off for the weekend. So the jury's out until Monday, when Zero Waste Week actually ends. I know it's not quite the most interesting cliffhanger, but eh at least we've got a cliffhanger should one be needed! So with the butter wrappers left teetering on the edge, the only thing that's actually in the bin is still that plaster that fell off on Day 1. But watch this space...as there might be another contender in the waiting! It's only Day 6 and I've still got another day to go! Oh, the excitement...! Anyway as it's the weekend and I know that we've all got better things to do than watch paint dry, I'm off to enjoy myself with the family. 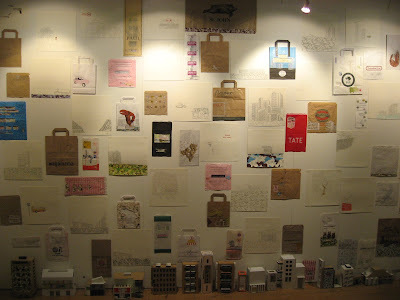 If you live in or near to Bury St Edmunds and you're looking for something to do this weekend, I can recommend a visit to the Bury St Edmunds Art Gallery, where amongst other delights, if you're an arty type you'll find another way to recycle your paper bags! I hope to see you on Monday for the final Weigh-In. Have a great weekend. I thought I'd better start at the beginning of your blog, so last night I read the bit where you seem to decide to buy butter in plastic pots because you thought it the better option. If you are still of that mind, I'd like to point out that more resources are probably needed for the actual pot and chances are for the manufacture of the pot as well. 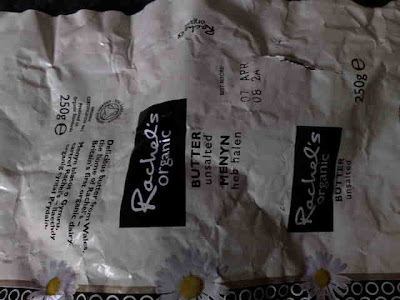 As to whether you can recycle butter wrappers, those I use are made from a thin sheet of aluminium foil stuck to a thin sheet of greaseproof paper or something like that. When we stayed in Germany for a few months we had to separate the silver foil from the paper, so the other day I thought I'd have a go doing just that. It didn't come off clean, so I decided just to recycle what came off without much effort, and put that amount in with the milk bottle tops and aluminium from quiches and tarts etc, which we collect in an old ice cream tub on the kitchen windowsill. If you really want zero waste you could probably compost the paper even with little bits of aluminium foil on, but I think I put it in the bin. Hi again - re the yoghurt pots.... Call me an old cynic if you like, but just because the council collects them for recycling doesn't necessarily mean that they get recycled. If you discover that they really do, please let me know where they are sent. We knew of a firm in Scotland who don't do it any more, but have not found anyone else. If on the other hand all your recyclables are shredded and then separated, the percentage actually recycled may be pretty low. Hi Karin - thanks so much for that top tip. You'll see from my latest post that I took your advice. The components were the foil and some very thin plastic film. Hopefully, I'll get the low-down from the manufacturer today. Him Timx - on occasions it pays to be cynical - I will most definitely check that one out! Congratulations on the blog. I have just caught up with WW and have spent the whole afternoon reading your blog. Butter papers. My granny always used them for buttering cake tins, so now I put my old papers in the freezer until I bake, then I put them in the bokashi. I have swopped to cheap butter purely because it is wrapped in paper. Just don't add salt to the recipe to balance it out. found the info on butter wrappers!! we have most of smaller plastic bags & such & aluminum stuff in old ice-cream containers and such too, like Karin!